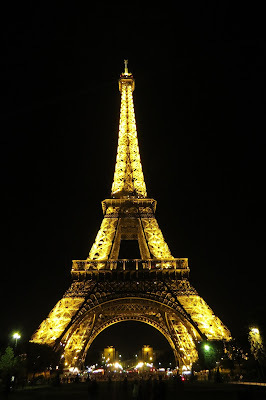 State of Thoughtless Stupor: What Happens in France . . . Some more random experiences from our recent trip to France. Prior to going to France, we didn't know if our apartments would have soap or not, so Stephanie decided to bring a little with us. Why buy more when you can save money using what you already have, right? Well maybe we sometimes go a little overboard with our efforts to conserve a few pennies. I don't think of us as cheapskates, it's just that if we save money on the little stuff—like darning holy socks—then we can afford the big stuff—like a night out at the Costco Food Court. Rather than taking an entire soap bar, Stephanie instead found some decorative soap carved into a flower. What else are you going to use something like that for? Sure enough, our second apartment had no soap. I dutifully retrieved the flower and started lathering up in the shower. Unfortunately, I quickly learned that it wasn't regular soap. Instead it turned into Play Dough when wet. It instantly stuck to my skin like a plaster sarcophagus. It was like the spray-on shoes in Cloudy Without Meatballs, except I had it everywhere, and it pretty much took a putty knife to remove. But I did smell like flowers afterwards. Sometimes cheapness doesn't pay. 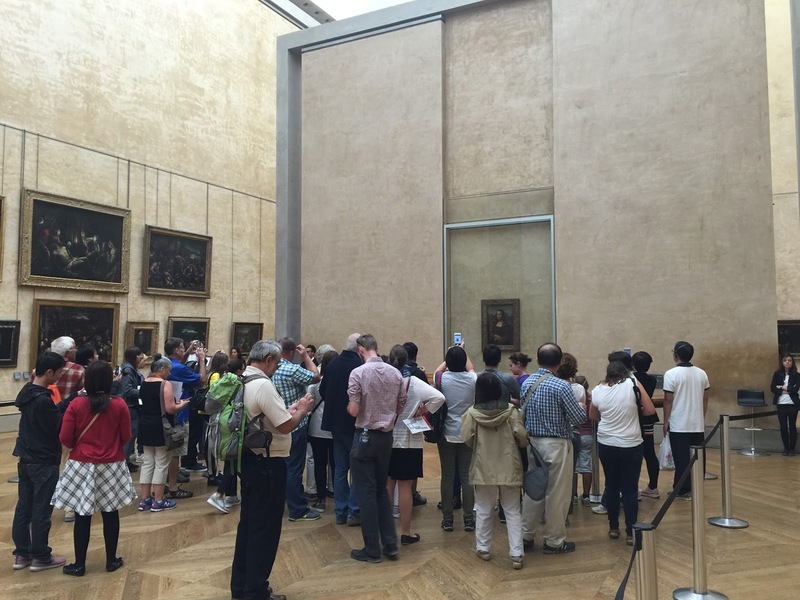 It's somewhat mandatory to see the Mona Lisa if you go to France. And that means a trip to the Louvre Museum—and of course getting there before the crowds do. We got up very early one morning to catch an early metro to the museum district. We entered the museum from the secret, hidden door in the underground metro stop. We rushed through the mall and after a few wrong turns, ended up about tenth in line at the security screening, ready for the doors to open. We'd done great so far, but still had to get through security, past the ticket checker, and find our way to the special hall dedicated to Mrs. Lisa. As soon as the gates pulled open, we set off at full speed. We clawed our way upstairs and flashed our passes at the ticket station. I navigated with the map while Stephanie threw elbows. We finally made it to the Grand Gallery, dashed through the hall, and ended up in fourth place, standing in front of the most famous painting in the world. And were we ever disappointed! She really isn't much to look at. Her colors are all faded, she's quite small, her smile looks forced, and she's behind a wall of reflective glass that makes it impossible to take a good photo. So we just started laughing that we'd basically just committed several crimes and got there first to see something so underwhelming. The others there all laughed with us. It was like we'd just scored a major victory and our prize was a pack of Pez. So we turned around and took pictures of everyone else taking photos of Mona. That was more entertaining. As we headed towards the airport on our last day in France, a giant flying insect attacked our train car. Not from the outside—that would have been okay. Rather, it emerged from an A/C vent near Stephanie's head and flew around the inside. It was a bee, about two centimeters long. And it flew very fast. Each time it dive bombed towards a group of passengers, they'd all scream and duck, in that order. Thankfully, it headed towards the far end of the car. Within minutes, though, it swung back around for a second run. It soared straight for Stephanie again, just missed her, then hid behind our chair. The only thing worse than a giant bee you can see is one you can't. We leaped from our chairs as the whole train watched with horror. The bee slowly crawled out from behind the bench and stared us down. Not wanting to lose the advantage, I switched to offense and pounced with my shoe. A collective gasp sounded throughout the car and everyone held their breath while I stood away to assess the damage. It was down, but not out. I had to squish twice more to complete the kill. Finally, it was finished. 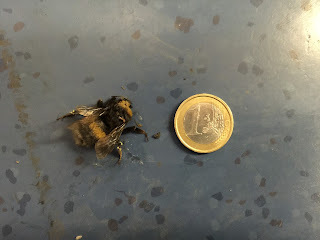 So we all pulled out our phones and took pictures of the valiant dead bee.